St. Martin's Press, 9780312363017, 256pp. 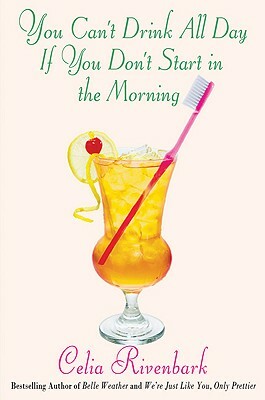 Complete with a treasure trove of Celia's genuine southern recipes, "You Can't Drink All Day if You Don't Start in the Morning "is sure to appeal to anyone who lives south of something. Celia Rivenbark is the author of the award-winning bestsellers "Stop Dressing Your Six-Year-Old Like a Skank; Bless Your Heart, Tramp"; and" Belle Weather. We're Just Like You, Only Prettier" won a Southern Independent Booksellers Alliance (SIBA) Book Award for nonfiction and was a finalist for the James Thurber Prize for American Humor. Born and raised in Duplin County, North Carolina, Rivenbark grew up in a small house "with a red barn out back that was populated by a couple of dozen lanky and unvaccinated cats." She started out writing for her hometown paper. She writes a weekly, nationally syndicated humor column for the "Myrtle Beach Sun News." She lives in Wilmington, North Carolina.